The four wheeler market in India presently lacks the presence of affordable hybrid vehicles, the Toyota Prius and Camry aren’t exactly built for the masses. India’s largest car maker Maruti Suzuki plans on changing that, with the introduction of low cost hybrid tech which is under development at Suzuki’s headquarters in Japan with inputs from the Indian R&D facility as well. This low cost hybrid tech will be available in the cheapest car in the line-up right from the Alto to the more expensive Swift hatchback in the next 3-4 years. A company official speaking about the low cost hybrid tech said, “It is no more a concept. The real work is under way and the hybrid technology development is at an advanced stage. A large part of the development is happening in Japan and key inputs from Indian R&D engineers are also being absorbed. The idea is to offer a technology to the mass with not a major price difference over existing petrol cars.” The company is targeting a fuel efficiency gain of around 20-30% which, if achieved, coupled with the cost effectiveness could very well be the next big thing in the mileage conscious Indian market. Hybrid vehicles are basically powered by a conventional internal combustion engine coupled with non-conventional electric motor(s) which work in tandem depending on the load. Most hybrids make use of regenerative braking to recharge the batteries hence, an external source of electricity is required. 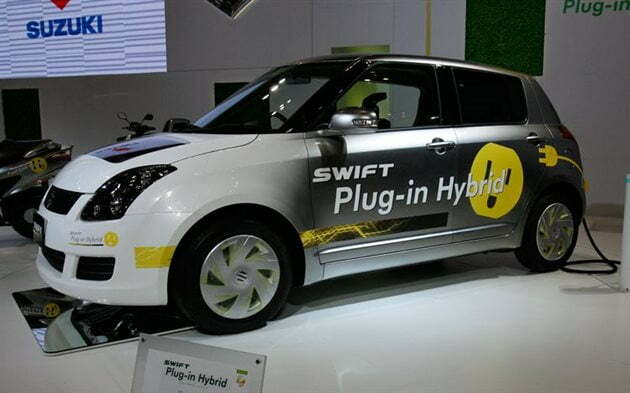 Suzuki currently employs this hybrid technology in it’s vehicles with a hybrid version of the Swift being sold internationally but it is too expensive for the cost conscious Indian market and might not be successful. Much like the Honda Civic hybrid which did not find many takers thanks to it’s high price and eventually the company had to sell it at massive discounts to clear out the stocks. The country need hybrid tech no doubt especially with the rising fuel prices and levels of pollution and Maruti aims to reduce running costs and bring down CO2 levels with it’s low cost hybrid tech. The company will be looking ot emulate what it did with the AMT which has made automatics popular among the Indian car buyers as it is marginally more expensive than the manual and doesn’t compromise on fuel efficiency significantly. RC Bhargava, Chairman of Maruti Suzuki said “Nobody else does the AMT at that scale, but the Indian customers require that AMT in small cars. People can’t afford to get an automatic at Rs 1 lakh premium. And, we need the same thing in hybrids.” Pure electric cars might not sell in big numbers therefore, hybrids are the need of the hour. The introduction of Maruit’s low cost hybrid tech might coincide with the Central Government’s National Mission for Electricity Mobility plan which could result in significant subsidies on electric and hybrid vehicles to promote their usage. The mission aims to achieve sales of 1.4 million electric and hybrid vehicles in the country by 2020 with fuel savings of around 0.4 million tonnes. Low cost hybrid tech and Government participation is exactly what is needed to popularise HEVs or Hybrid and Electric Vehicles in India. With the introduction of Maruti’s low cost hybrid tech in cars such as the Alto and the Swift and the National Mission for Electricity Mobility initiative we will be able to increase efficiency significantly and keep pollution levels in check. Sounds like a total win-win situation. What do you think of this development? Would you be interested in buying a hybrid vehicle? Let us know in the comments section below.